Mr WOODS: . It is seven months since the Olympics and Paralympics and one of the more unusual images during the Olympics was the millions of bogong moths that at one stage invaded the stadium. For a little while during the closing ceremony the moths shared the limelight with the world-famous Australian opera singer, Yvonne Kenny. The international media carried stories about the bogong moths... Quick thinking by Olympic organisers and a New South Wales country business fixed the problem. A company called No Bugs Pty Ltd that is based in Forster on the State's mid north coast came up with an ingenious product-an Australian first-to handle the invasion of bogong moths. They saved the day with 53 specially designed bug eaters. It is a trap that attracts and captures moths. Using a black light to attract the moths, and a fan to blow them into a water tray, No Bugs reckons they caught millions of moths. The invention is clean and green: No poison, no pesticides. The traps are cheap-$200-and they were a great success. Hats off to Ray Webber and Jenni Timbs who are the Aussie battlers behind this project. ...The company is offering its unique product to a range of industries. Tomato farmers in Ballina are using the Bug Eater to monitor what types of bugs are attacking their crops, which has allowed them to limit their spraying to specific types of bugs. That saves farmers money and provides better quality tomatoes for consumers. Janges Noodles of Canterbury Rd, Campsie, Sydney, owner James Janges said, "I heard about this from a food industry consultant, I was advised to get one, so she could sign off on my factory preparation areas. We got rid of the moths causing weevils in our flour staroage area and we have them in the preparation area. I tell my friends everyone should have one; I even bought some for family." Pacific Palms Public School, on the mid north coast. Principal Ken Pares said, "We had parents who kept their children away from school and even the staff had problems with mosquitos, we installed 11 Bug Eaters after our school commitee investigated the product, We had relief within days and now rarely see a mosquito. I was so happy I bought one for home. Seashell Cove Resort, Fiji "It is now six ,months (Oct 02) since we purchased our Bug Eaters from your company and I decided to tell you, that this is one of the best investments we have made in years! We are absolutely delighted to have such a fantastic product for our hotel. We also welcome any one to come and inspect, we are proud to show how effective Bug Eaters are for the health and comfort of our guests". Marina Holiday Park, Port Macquarie. Owners Neil and Allen say, "We have had bug eaters here since we first saw them 5 years ago, we had a bad sand fly problem from the river in front, our guests are protected and they can enjoy the area. We tell everyone to buy them." Moore's Nursery, Aldavilla. "Prior to the purchase, we were spraying twice weekly for caterpillars on our gerbera crop. The result has been outstanding. In one glasshouse we have not sprayed since the purchase of the bug eaters. In the other glasshouse, we have sprayed only once, after a small outbreak of caterpillars. Tyrrell's Wines, Hunter Valley. "Bug Eater enables vinegar fly numbers to be controlled effectively without spraying. We have been using the "Bug-eater" in our bottling hall for over 18 months now (May, 2004), with tremendous success, and we have purchased another half a dozen units to use in the wine cellar." J Brown, Mt Coolum Qld. "Firstly, a note of thanks for the prompt postage. Great service! 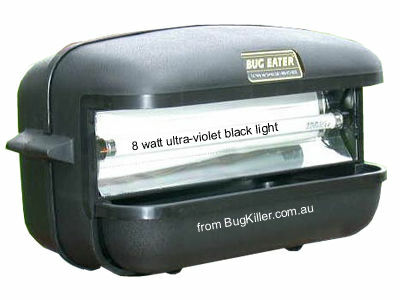 Secondly, an endorsement of the Bugkiller, which, in just a few days of use, has exceeded our hopes regarding a solution to the dreadful invasion of mozzies in our back garden. We are happy customers, and highly recommend this excellent product. Thanks and regards, Jenny"
Christine Hopes, Elanora Qld "We are often asked about the unit by our visitors and we freely extol its' virtues. We have never regretted purchasing the unit (best decision ever) and it is running every night, so, we have had an exceptional run with the light. Thanks again for your prompt service and a great product." Dr Andrej Panjkov, Australia. "I have just refilled the water trap in my Bugeater and that has reminded me that I should email you to compliment you on a very well made product. I admire machines that work reliably for many years, and I am constantly surprised at the longevity of my bug eater. It has been running continuously, that is, without being switched off, for 8 years. (Apart from the occasional power outage, and one power-off when I moved house two years ago.) In that time, I have changed the black light element once, and the fan has runs smoothly and quietly the whole time. When I first bought my bug eater, I grumbled at the price. After all, it's just a fan and a light. But it seems to be a very well engineered fan and light, that has far outlasted my expectations. I hope this is not an accident and that the device's longevity is due to good engineering and quality components. Anyway, the product works superbly, controlling bugs in my kitchen. And as I said, I am highly impressed with the device's reliability and longevity. Thank you for one of those rarities, a truly excellent product. I give you permission to use this email in your promotions, as long as it is used unedited, including this paragraph. Copyright (C) 2008 Andrej Panjkov. Hope Morrissett, British Virgin Islands. "I want you to know that this is by far the most effective bug control system we have used at our home in the British Virgin Islands. We've tried everything else - from low-tech to high-tech, and nothing really helped before your bugeater. I've given one to our architect who's designing a remodel for us in the BVI. It also has worked incredibly well for him." John Carmichael, Wallabi Point NSW, "We couldn't stay in our back yard once dusk approached, because the mozzies would drive us inside. After getting a bugeater we noticed the difference in a couple of weeks. A month later we could go outside all night without seeing a mozzie. This really does work! We were so impressed with this Australian product, that we decided to start selling it on-line. Get yourself one - you won't be disappointed"
Alex Smith Twin Waters Qld. Thank you for the prompt postage. This is our 2 nd installed in our house and they are brilliant. We live on a canal system and before we would not dare to venture to the water after 5pm. Now after 2 weeks of the BugCatcher at work we can fish and play well into the night. Our children have no more nasty welts on their legs. Overall your product is well worth every cent and I fully recommend it to anyone. Anne Mullington Lightning Ridge NSW This bugeater is so good. I bought one to protect the dog from the mozzies. I've only had it for 2 weeks and I'm buying another one for the lawn grubs. I recommend it to all my friends. Joel Prigge Goroka, Papua & New Guinea: I recieved the package with the bug eater with no problems here in PNG. Thanks for your help. I will be ordering more bulbs and likely another unit. The thing works great! We had about 30 mosquitoes in 1 hour! Great Machine!. Kevin Coleman Cherrybrook NSW. Both of our children are impressed with the success of our bug killer. Therefore, we wish to order 2 more as Christmas gifts for them. Frank Whitehead Wagga Wagga NSW. Bug killer arrived before Christmas-it works soo well-the tray is FULL after only two nights..we are having a huge mosquito problem in Wagga and the Riverina after the huge rains and floods..Thank you for a great Aussie product..
Disclaimer No insect prevention device or product, including The BugEater, will completely protect you from insects and/or mosquitoes. It is your responsibility to use any and all means available in order to protect yourself from harmful insects and their effects. Please act responsibly when spending time in an environment inhabited with insects and/or mosquitoes.